There are several different form factors of the Micromodem Power Amplifier to support numerous applications variables. A power amplifier’s size is often dictated by the acoustic signal frequency and acoustic source level required for a particular application. In general if the signal frequency is decreased and/or the acoustic source level is increased, then the larger the matching magnetics and the power amplifier need to be. 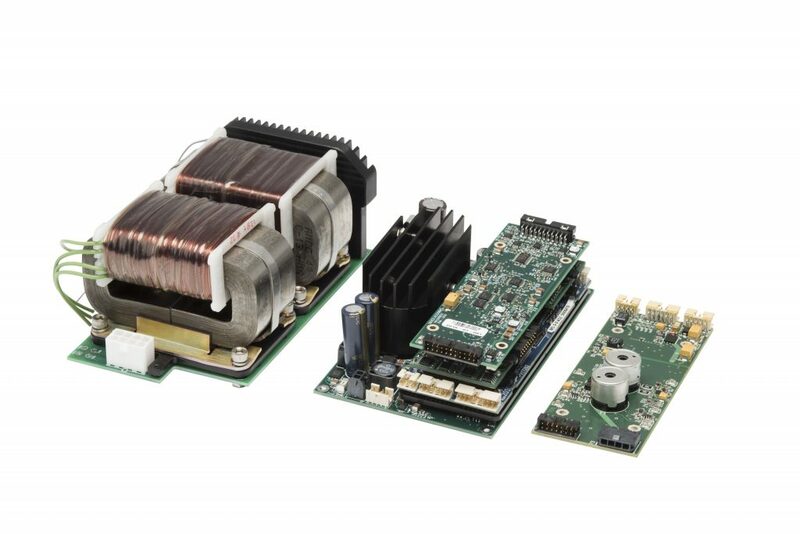 Below is a picture of several of our power amplifier form factors. From left to right: 202009 RFF OBM, 202006 RFF, 202007 Low Source Level Linear. The 202007 power amplifier was design for applications that require the smallest form factor possible for short range communications (less than 250m-500m) at 25kHz carrier frequencies. The 202006 power amplifier was design for applications that require a small form factor medium range communications (greater than 1km) at carrier frequency between 10kHz-25kHz. The 202006 power amplifier has a wide input supply range and a regulated output drive for consistent acoustic source level regardless of the supply voltage. The 202006 power amplifier can adjust the output source level in (4) discrete levels via the Micromodem 2, external I/O or on-board DIP switches. The 202001 power amplifier was design for applications that require a small long form factor medium range communications (greater than 1km) at carrier frequency between 10kHz-25kHz. The 202009 power amplifier was design for applications that require a small to medium form factor for long range, communications (greater than 1km) at carrier frequency between 1kHz-10kHz at high source levels. The 202009 power amplifier is similar in functionality to the 202006 power amplifier but allows for off-board magnetics. The use of larger off-board magnetics allows for Micromodem configurations that can operate at low carrier frequencies and/or high source levels. The 202009 power amplifier can adjust the output source level in (4) discrete levels via the Micromodem 2, external I/O or on-board DIP switches.